The poster had a complaint which read: "Because of Mr Gandhi's absence, development projects and other works which were supposed to be carried out under his administration as an MP have stalled in Amethi." Amethi: Posters declaring "Rahul Gandhi missing" are on display across Uttar Pradesh's Amethi, a VIP constituency courtesy the Congress vice-president who represents it in parliament. The poster, which also states that "anyone giving information about Rahul Gandhi will be rewarded", comes as a new embarrassment for the Congress, which has quickly termed it as a "handiwork" of the BJP and RSS. 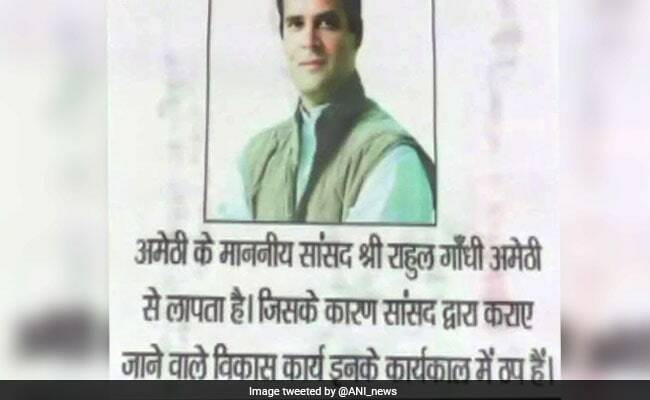 The poster, which has text printed in Hindi with a large photograph of Mr Gandhi reads, "Amethi ke maanniya saansad Shri Rahul Gandhi Amethi se laapata hain" (Respected parliamentarian from Amethi Rahul Gandhi has been missing from his constituency). 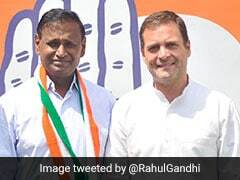 Mr Gandhi, who has been criticised several times by the BJP for neglecting his constituency, last visited Amethi around six months ago to campaign for the state election. Residents of Amethi, which has been a Gandhi family stronghold for decades, have also complained about the lack of development in the past. In fact, a village in the constituency had even boycotted the Assembly election held in the state earlier this year. The poster also had a complaint which read: "Because of Mr Gandhi's absence, development projects and other works which were supposed to be carried out under his administration as an MP have stalled in Amethi." The poster further states that "The common man is feeling cheated and humiliated due to his behaviour." It even goes on to offer a reward saying, "Anyone giving information about Rahul Gandhi will be rewarded." Yogendra Mishra, the District Congress chief, accused the BJP and RSS of a "conspiracy" to defame the Congress. He claimed that such things have happened in the past as well and said that the Congress "will register an FIR in this regard with the local police." The BJP has completely dismissed allegation leveled against it by the Congress. Slamming the Congress for "their own fault", Uma Shankar Pandey, BJP's district president said: "Had he (Rahul Gandhi) done something for Amethi, the situation would not have arisen." Additional Superintendent of Police BC Dubey said that the police have not received any complaint in this matter yet. "If we get a complaint, we will investigate and take necessary action," he said. Last week Mr Gandhi met residents of Amethi in Lucknow, where he had gone to submit a memorandum to the National Highway Authority of India (NHAI) regarding land acquisition of farmers for roads in his constituency.